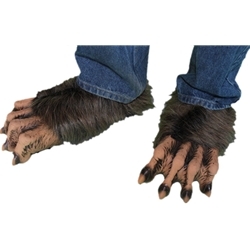 These brown hairy werewolf feet can be paired up with one of our werewolf masks and a tattered outfit to create a quick and easy werewolf costume for Halloween. They can also be used by directors who are producing Beauty and the Beast as feet for the beast. The brown hairy werewolf beast feet are one size fits most. For larger feet wear with a pair of socks and for smaller feet wear over the shoes.